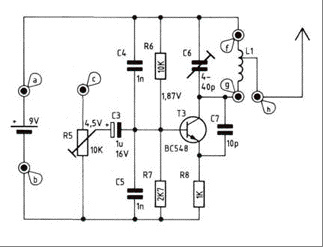 Electronics-DIY has instructions on how to build a simple portable FM transmitter that would allow your iPod to broadcast music over radio waves. It is simple to build and fits into a mouse case. 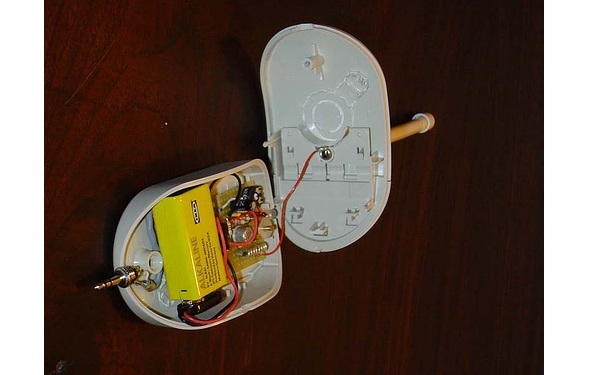 It works quite easy, there is a power switch on the bottom to turn it on and tune your radio and transmitter to the right frequency. For the antenna you can use a copper wire of 70 cm. The range of this FM transmitter is about 100 to 150 meters (500 feet). With R5 you can adjust the input signal and with C6 you can tune your frequency. Transmitter is supplied by 9V battery. Check out the schematic below. This entry was posted on Tuesday, December 6th, 2011 at 6:00 pm	and is filed under DIY. You can follow any responses to this entry through the RSS 2.0 feed. You can skip to the end and leave a response. Pinging is currently not allowed.